Fuchs’ dystrophy (pronounced fooks DIS-truh-fee) is a disease of the eye that is characterized by degenerative changes to the innermost layer of cells of the cornea. The cause of this condition is not fully understood. If one of your parents has the disease, there is a roughly a 50 percent chance that you will develop it as well. While Fuchs’ dystrophy can sometimes have genetic causes, however, it can also occur in individuals who have no known family history of the disease. Fuchs’ dystrophy usually causes vision problems in those who are 50 years or older, although symptoms are sometimes diagnosed in younger individuals. While Fuchs’ dystrophy can affect both genders, women are more commonly diagnosed with it. This eye disease affects the innermost layer of cells in the cornea, the endothelium, causing degenerative changes. As it progresses, the cornea swells (known as a cornea edema) and clouds, which causes a decline in vision. Finally, the swelling causes blisters to develop on the front of the cornea, a condition known as bullous keratopathy. Fuchs’ dystrophy symptoms include foggy vision, blurred vision, eye pain, the appearance of halos around a light source, sensitivity to light, and vision trouble at night. It is typical for individuals to experience poor vision upon waking that improves later in the day. It is also common to have the sensation that a foreign object (e.g., an eyelash) is in the eye, even though there is nothing there. Diagnosis of Fuchs’ dystrophy requires a comprehensive eye exam. 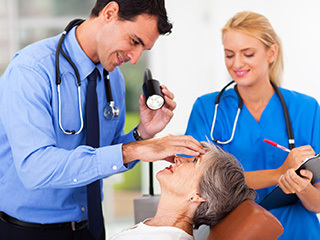 During this exam, an eye care professional uses an instrument called a “slit lamp” to closely examine the cornea. The slit lamp magnifies the cornea, allowing the eye care professional to detect subtle changes to the cornea’s endothelium cells, which characterize the disease. The earliest clinical signs are a reduced number of endothelium cells and small, drop-like lesions along the endothelium. Treatment for Fuchs’ dystrophy depends on the stage of the disease when the diagnosis is made. If the diagnosis is made in the early stages, it is possible to improve vision with special 5% sodium chloride drops that help to remove excess water from the cornea. If the disease is caught in the later stages, a cornea transplant may be necessary to replace a ruptured cornea. A new treatment known as DLEK (deep lamellar endothelial keratoplasty) can serve as an alternative and will replace the endothelium while leaving the upper layers of the cornea untouched. Last but not least, if you have been diagnosed with Fuchs’ dystrophy, please keep in mind that certain eye surgeries, including LASIK, can actually worsen this condition.